The loss-of-earnings portion of a jury’s $4.7-million damages award in favor of a worker who was injured after falling from a ladder was reduced by a Florida federal court because the evidence showed that the worker had no earning capacity after he suffered several strokes and seizures that were unrelated to his ladder accident. In addition, the jury had found that he was 30 percent at fault. Thus, the damages award was reduced to $1.9 million. However, the manufacturer and the seller of the ladder were not entitled to a new trial (Ore v. Tricam Industries, Inc., Order, Final Judgment, October 16, 2017, Scola, R.). The worker was injured when he fell from a ladder while retrieving a tire from a rack at his job at a tire store. He filed suit against the ladder’s manufacturer, Tricam Industries, Inc., and the seller, Home Depot USA, Inc., alleging that the ladder was defective, that the companies failed to inspect it, and that they failed to warn him of the defect. Several years later, he suffered multiple strokes and seizures, resulting in a stay of his case. Jury verdict. The matter ultimately was tried before a jury, which returned a verdict in favor of the worker with respect to liability. The jury awarded him more than $4.7 million in damages, which included $517,000 for loss of past earnings and $1,800,000 for future loss of earnings. The defendants moved for a directed verdict limiting the award for loss of earnings (both past and future) based on evidence adduced at trial showing that the worker had no earning capacity following his strokes and seizures, which were unrelated to his ladder accident. The defendants also moved for a new trial based on numerous evidentiary rulings. Motion for directed verdict. The court granted the defendants’ motion for a directed verdict. The worker’s treating neurologist testified that the worker was able to work following his fall from the ladder but was unable to work after his strokes. The neurologist also opined that the worker’s strokes and seizures were unrelated to his ladder accident. 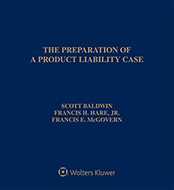 Contrary to the worker’s argument, the measure of his damages for loss of earning capacity was not an affirmative defense but, rather, was an element of economic damages for which he bore the burden of proof. However, he failed to present any medical evidence or testimony to rebut his neurologist’s opinion. Indeed, all of the doctors involved in his care agreed that he could return to work prior to his strokes but not afterward. The court also found that limiting the worker’s damages for loss of earning capacity based on an unrelated subsequent injury was not contrary to Florida law. In addition, the court rejected the worker’s attempt to characterize this case as involving a distinction between loss of future earnings and loss of future earning capacity. Because the evidence showed that he could work after the ladder accident but not after his strokes, he was not entitled to recover any amount in damages for loss of earning capacity past the date on which he suffered the strokes. Consequently, his award for past loss of earning capacity was reduced to $349,953, and his loss of future earning capacity was reduced to zero. Motion for new trial. However, the defendants’ motion for a new trial was denied. Contrary to their assertions, the court did not err in admitting an accident-causation opinion by the worker’s liability expert or in excluding as unreliable a causation opinion by the defendants’ expert. Also rejected were the defendants’ arguments that the court erred in: permitting the worker’s treating doctors to render expert opinions for the first time at trial; denying the defendants’ motion for a mistrial following improper and inflammatory remarks made by the worker’s counsel during closing argument; and bifurcating the trial. Final judgment. In its verdict finding the manufacturer and seller liable, the jury also had determined that the worker and another entity were 30 percent comparatively negligent. Thus, the court reduced the remaining damages award by 30 percent and entered final judgment in the amount of $1,918,526.54. The case is No. 14-60269-Civ-Scola (Order; Final Judgment). Attorneys: Brady James Cobb (Tripp Scott) for Moises Ore and Noemi Ore. Paul V. Kaulas (McVey & Parsky LLC) for Tricam Industries, Inc. Jeffrey Arthur Mowers (Lewis Brisbois Bisgarrd & Smith, LLP) for Home Depot USA, Inc.
Companies: Tricam Industries, Inc.; Home Depot USA, Inc.